The kids in this neighborhood are quite competitive and they are organising races. the goal is to of course reach the finish line as high up in the ranks as possible. The race isnt that cllean meaning that you can throw a snowball at the opponents to slow them down and there are lots of gaps in the ground to fall through. Make sure you will try to get some nice advantage from the others to gain the most points which will allow you to upgrade. Have fun and try not to fall in the gaps yourself as valuable time will be wasted if you do so. 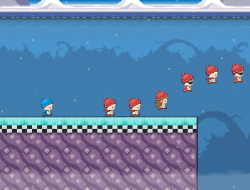 Use X to jump once or twice for a double jump and C to throw snowballs. Turbo Kids 0.00 between 0 and 10 based on 0 votes.